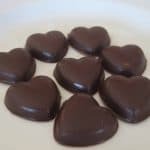 This allergy free chocolate candy is simple to make, uses minimal ingredients, and is dairy free, egg, free soy free, peanut free, tree nut free, and wheat/gluten free. Combine the chocolate chips and oil in a glass measuring cup. Microwave in 30 second increments, stirring between each time, until chocolate is smooth. (Be careful not to microwave too long). Pour chocolate into decorator or pour into a plastic bag and snip the corner off. Pipe the chocolate into the molds. Lightly shake the mold to even out the chocolate in the mold. Place molds in the freezer for about 1 hour. Remove molds from the freezer, turn over and gently pop the candies out of the mold. Store in an airtight container in the refrigerator.